Josh Carson broke Ards’s hearts as he fired in a stoppage time winner to secure all three points for Coleraine at the Bangor Fuels Arena. The midfielder showed great composure to slot home to earn the Bannsiders all three points. The result was harsh on the home side though who deserved something for a much-improved performance. Colin Nixon made three changes to the side which went down 4-1 at Clifornville with Michael Kerr, David McAllister and Joshua Kelly replacing Eamon McAllister, David McAleenan and Craig McClean. The visitors were forced in to one change to the same which drew with Glenavon last Saturday with Graham Crown coming in for the injured Aaron Canning. The defender found himself in the referee’s notebook inside four minutes following a robust challenge on Kyle Cherry. It was end-to-end stuff in the opening exchanges with both sides knocking the ball about sharply on the slick surface. Kym Nelson was first to threaten on goal as he wound up a free kick on 16 minutes, but it was easily taken by Chris Johns. Jamie McGonigle tried his luck at the other end two minutes later, but Sam Johnston was as equally untroubled. The forward should have done better on 26 minutes when he picked the ball up at the back post, but his half volley flew well over the target. The Bannsiders were becoming more of an attacking threat with Ben Doherty testing Johnston from distance a minute later. The keeper produced a fantastic save to deny Mark Edgar a goal on 29 minutes as his curling free kick looked destined for the top corner but for the keeper’s excellent tip over. 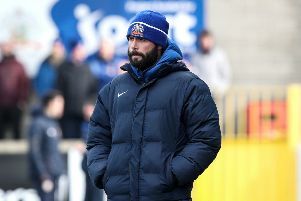 Ards responded with David McAllister fizzing a shot over from the edge of the box on 32 minutes. Within a minute the visitors had taken the lead though as Ben Doherty finished off a sweeping Coleraine move with a controlled finish from outside the area. Withinsix minutes the hosts were level thanks to a great strike from former Coleraine man Gareth Tommons. Michael Kerr’s persistence saw him tee up Tommons, who swept the ball home past Johns. Johnston was brave to deny Doherty a second three minutes before the break. The second half took a while to heat up as temperatures plummeted in Bangor. Doherty almost repeated his feat of the first half as he pinged one from 20 yards, but this time it ended up on the other side of the post. Ards went close to grabbing a second with 15 minutes to go as Cherry glanced a header on to the bar from Bennett’s centre. Two minutes later Bradley headed straight at Johnston from Carson’s corner. The home side had a big shout for a penalty on 78 minutes as Edgar tangled with Bennett, but referee Andrew Davey pointed for a goal ki ck. Three minutes later it was Coleraine’s turn to feel aggrieved as Johnston seem to take down Bradley in the box, but again the referee was unmoved. Ards should have done better on 85 minutes as Kelly crossed for Cherry, but he could only direct his header wide of the target. The home side did have the ball in the net in the 90th minute, but Mark Kelly was adjudged to have been offside. Three minutes into stoppage time Coleraine struck the winner as Carson broke clear and kept his cool to slot past Johnston. From the kick off though Ards almost grabbed an equaliser as Tommons had a shot parried by Johns before the keeper grabbed the loose ball. Ards: Johnston, Kerr, Byers, Cherry, D. McAllister (Bennett 67), J. Kelly, Tommons, Nelson, Evans, Smith (E McAllister 32), Henderson (M Kelly 71). Coleraine: Johns, Mullan, Lowry, Bradley, Carson, Crown, McConaghie, Glackin (McLaughlin 79), McGonigle (Parkhill 59), B. Doherty, Edgar.